Though I reject this image, the nature of our implicit bias is such that I must admit this is implanted in my subconscious. Such an image was promoted by Ronald Reagan with his account about a Black woman Linda Taylor who allegedly created multiple identities and swindled taxpayers out of thousands of dollars. His characterization of her as the “Welfare Queen” has plagued women of color through the decades. I recently spent a Saturday afternoon on a Reality Tour, a bus trip organized by a local group (details in Resources). We were introduced to St. Joseph’s Neighborhood Center, the city’s new “Tent City” for homeless people on Exchange Blvd., the House of Mercy, and other sites related to homelessness and poverty. The stop that impacted me most was the parking lot of the Department of Social Services on St. Paul St. where I met the “Welfare Queen”. She is the mother of two girls whose father had left them some time back. She described the process she endured to secure some support while she worked feverishly to build a non-dependent life. We were given the “NYS Application for Certain Benefits and Services”. I have never encountered a more complex, ponderous, intimidating form in my lifetime. 18 pages of excruciating detail, tiny print, followed by 6 tedious pages of “Notices, Assignments, Authorizations and Consents”. I secured a mortgage for our home with far less paperwork or laborious detail (this is not hyperbole). The form was just a beginning. LaVonia lives on the west side. She has no car, and that meant walking – about 2 miles each way – to this office. Imagine: the last leg of your trek is across this Bausch St. bridge in mid-winter. Many times, having completed the required info as well as she could, she would secure an appointment, arrive, then wait, sometimes hours, before being served, only to be told she didn’t have what was needed – e.g., birth certificates for herself and her children, receipts, medical forms, tax info, etc. etc. This meant setting another appointment. Then back across the bridge, and home. Once she finally obtained assistance, her life became a focused, exhaustive effort to get off of it. The assistance mandated a WEP assignment (Work Experience Program)– a job that was boring but required. She also beefed up her pursuit of a college degree, attending Brockport for classes. With the demands of the job and school and study, she rarely was able to spend time with her children. The welfare system also demands a quarterly in-person appointment to verify that all of the requirements are still being met. This means another form, and another trek to that office, another wait, another shot of “hope-I’ve-got-everything” anxiety. All of this was conveyed by LaVonia without a hint of self-pity, and with a sense of dogged determination (she is within weeks of graduating). Yes, the system is incredibly aggravating, but she has a passion for seeing this through, forging a future in which her children will not have to endure the same. To be clear: I’m sure there are people scamming the system. Now that I’ve seen the system, though, I have to believe they are few. This experience bolstered my belief that this convoluted, labyrinthine behemoth needs a comprehensive overhaul. My implicit bias about the Welfare Queen took a direct hit that day. I also know better than to think this bias won’t surface again, unbidden, unwelcomed. But there will be LaVonia’s face and voice and story to belie the image. What images do you carry regarding race, poverty, people on welfare? How can you/will you act to challenge those images, to get in touch with the realities of the lives of people you know only by stereotype? How can you test out the judgments and biases that fester in you? How are you complicit in this system as it exists? And what actions will counter your complicity? Workshop: Tues. Nov. 13, 7 – 8:30 pm: “Unpacking Waking Up White” by Debby Irving. Led by Calvin Eaton at 540 W. Main St.. Registration requested here. The Reality Tour is organized by the Social Welfare Action Alliance. Tour leader Ricardo Adams tells me the next tour will be in the Spring. I will post the info when I receive it. 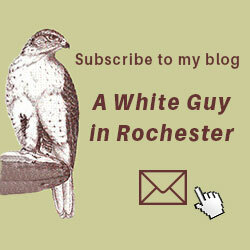 Relton Roland: reltonrr@frontiernet.net or Mike Bleeg: mbleeg@rochester.rr.com, or 585-704-1016. And again, you can find information on Howard Eagle’s activities at his FB page. Attend: Police Accountability Boards: A Panel Discussion and Community Forum; co-sponsored by Monroe County Bar Assoc., the Greater Rochester Assoc. for Women Attorneys, the Rochester Black Bar Assoc., and others. Tues. Nov. 13, 5:30 – 7:30 MCC High Falls Conference Room 321 State St. Details. Attend: Truth Commission, Organized by Just Leadership (WNY branch) Friday Nov. 16, 6:00 to 8:00 p.m. Hear from people directly impacted by a variety of unjust practices in the legal system. Mt. Olivet Church, 141 Adams St. For more info. Previous postA Critical Missing Element – Urgency! Thanks Frank et al for this post and ensuing comments. The Tour is a must for anyone truly interested in meeting people where they are and then hopefully becoming a small part of their lives. With regard to Welfare Queens, we had the opportunity to twice visit the DSS office on St Paul in the last 2 weeks as we accompanied a refugee woman/mother trying to navigate the system. A few observations: continuous long lines of people who register and then wait to be called. Process takes hours every time they appear. There are students, refugees, disabled, multi cultural, young and old waiting to be called into the inner sanctum to meet with staff, Rarely did we see any smiles going in or coming out. What we did feel was a sense of many folks being on edge, nearly at a breaking point. This is not a place where one would choose to be for sure. Thanks, Dan, for helping dispel the myth. Thanks Frank. First I had to chuckle that I had such a similar experience just last week at the NCBI 30th Anniversary Celebration, that would bust that myth. During the keynote, Dr. Lloyd Holmes related his life story to the principles of NCBI. As he talked about being a child who grew up in extreme poverty, he described his Mom who many would describe as a “Welfare Queen.” What she did while on her throne was truly amazing as evidenced only in part by her son. Also, Frank, I appreciate the list of actions. I was aware of some but not all. The title of this is triggering. It’s unfortunate white white men like yourself have been conditioned to judge black wonen like this and that you still carry these biases in 2018. Calvin, thanks for replying. The title was intentionally provocative to encourage white folks to read it. I detest the term and would love to have an “Erase” button in my subconscious, but I know that’s not happening. I’m also very sure this blog’s subscribers carry these same demeaning images, even if they don’t “believe” them. It’s the nature of the racialized soup in which we’ve been raised. Thanks to both of you for pointing out the dilemma we face when we want raise awareness about images deliberately placed in our brains by those with an agenda to demean groups (in order to further their own greedy/power agendas). We are learning that just saying or writing the words, despite the intention to bring healing, can feel hurtful to the target groups. They can trigger old hurts caused by those with very different intentions. While it’s important for us to recognize that intentions sometimes need to take a back seat to a potentially hurtful reaction, it’s hard to imagine how to bring to light how widely and deeply that image has affected everyone — without saying what it is. Bravo to both Frank and Calvin for your courage and honesty! I certainly am aware of the Welfare Queen image and myth and like you, Frank have it in my subconscious. I also have worked as a volunteer in a support community, Hope House in Webster and have met and heard the story of many similar to Lavonia and recognize the reality of those in the welfare system. Thank you for exposing this myth once again. The Reality Tour is stunning and revealing. Dislodges many misperceptions about who is living with poverty in Rochester and what it’s like. Thank you for going on this tour, Frank, and for telling us about it. We need to know this.